Hundreds of Allahabad University students clashed with the police on Tuesday and torched vehicles during a protest against a varsity order asking them to vacate hostel rooms within a week. The students initially held a meeting at the university’s union hall at around 11.30 am and raised slogans against the order, which was issued as per a court directive last year, police said. After some time, students came out on the streets and went on a rampage, damaging public property, pelting cops with stones and setting police vehicles on fire, police said. 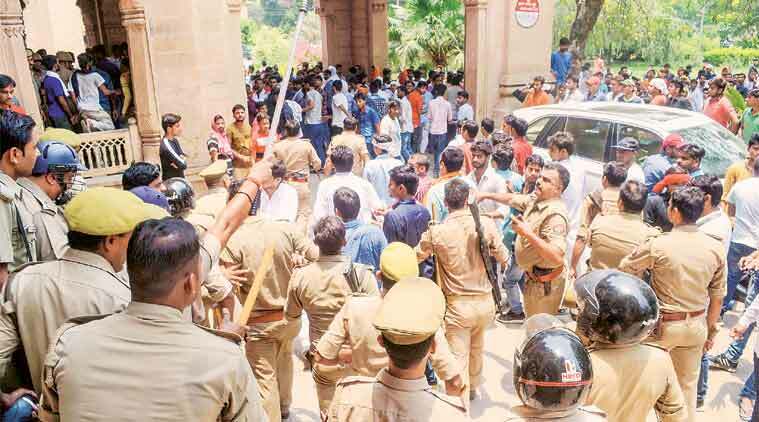 Uttar Pradesh Provincial Armed Constabulary squads and local police personnel rushed to the campus and used mild lathicharge to control the crowd. “We have registered an FIR against unidentified students. We are probing the matter,” SSP Nitin Tiwari said. On Monday, the university had put up the notice asking students to vacate hostels for the summer break. According to the notice, students had a week’s time, failing which police forces would be deployed to evict them by June 15. “Students are enrolled in hundreds of coaching classes and they study hard to make a career. The vacations are used for studying. Where will we go if we are forcibly evicted from here? Most students are poor and they come from distant districts,” MSc final year student Amit Saroj said. 1 After President expresses concerns, HRD summons governing bodies of 21 colleges: Why no principals?